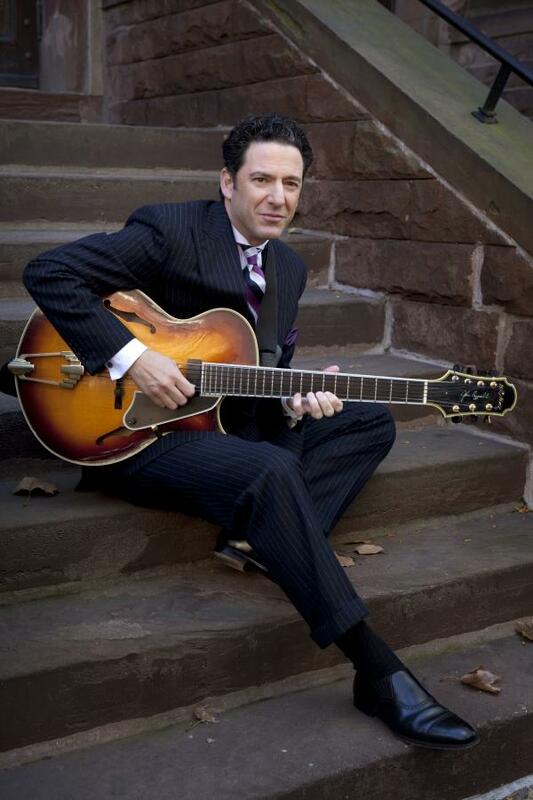 John Pizzarelli’s recordings have almost always reached well beyond the level of simply jamming a few tunes with his quartet. His thematically oriented tributes to Richard Rodgers, Nat “King’ Cole, Frank Sinatra, the Beatles and Bossa Nova, among others, have been superb settings for his singing, his guitar playing and his imaginative musicality. With Rockin’ In Rhythm, a tribute to Duke Ellington, he does it again and the results are extraordinary. One simply couldn’t have asked for a better production than what Pizzarelli has assembled – true to the spirit of its subject while remaining completely alive, unique and spontaneous. Start with the fact that there’s not a moment in which there’s a whisper of doubt that this is a jazz album, through and through. Pizzarelli’s singing is a significant element, as it should be. But so, too, are the hard-swinging, Ellington/Strayhorn-tinged arrangements by Don Sebesky, and the lively ensemble playing by the seven piece band he calls his Swing Seven. Add to that the individual soloing by virtually everyone in the band, along with the added contributions of singers Kurt Elling and Jessica Molaskey (Pizzarelli’s wife), guitarist Bucky Pizzarelli (his Dad), violinist Aaron Weinstein and tenor saxophonist Harry Allen. The sense of high spirited joie de vivre that was clearly present in the studio brings every track vividly to life. The opening “In A Mellow Tone” sets the mood for what is to come. Pizzarelli sings the line vibrantly before dipping into his vocal-with-guitar-line improvising (which surfaces on many other tracks, as well). Next up is the first of two tracks in which a pair of Ellington tunes are combined in intimate musical medleys. This one uses the old instrumental line “East St. Louis Toodle-Oo” as a background for Pizzarelli’s vocal version of “Don’t Get Around Much Anymore.” The album’s last track similarly links “Cottontail” and “Rockin’ In Rhythm” into an ineffably swinging finale. Other highlights abound: Pizzarelli’s gorgeously lyrical balladry on “In My Solitude” and “I Got It Bad and That Ain’t Good”; his lush, but articulate solo guitar version of “Squeeze Me”; the Lambert, Hendricks & Ross-like version of “Perdido” by Pizzarelli, Molasky and Elling; Harry Allen’s stirring tenor saxophone solos – hard-romping on “C Jam Blues, late-night-romantic on “I Got It Bad”; and pianist Larry Fuller’s brilliant work throughout – especially the buoyant stride solo on “Rockin’ In Rhythm” that nearly steals the record. There’s not a track that doesn’t demand the enjoyment of repeated hearing. Although it’s still very, very early in the qualification year, Rockin’ In Rhythm already makes a convincing case for its inclusion in the nominations for Best Jazz Vocal album in the 2010 Grammy awards. Next Post Live Jazz: Bill Cunliffe’s Imaginacion Quartet at Vibrato Grill Jazz…etc.